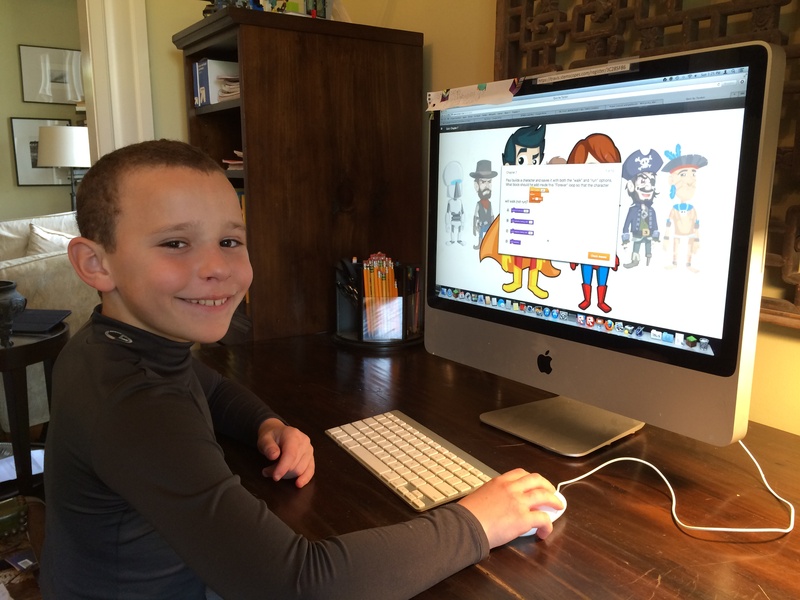 Tyrus Taught His Older Sister How to Code! What do you want to be when you grow up? I want to be a scientist when I grow up! What’s your favorite subject in school? Well, we don’t have science class at school, but if we did, it’d be my most favorite. My favorite subject in school is math. There is science club, though. Sometimes we’d practice for the Science Olympiad thing, other times we’d do robotics or other science-y stuff. Like we’d make rockets out of paper, blow them through a straw, and see which one goes farthest. Or we’d make choppers out of paper and drop them off of something high. You have to make one go clockwise, counter-clockwise, and make one spin very quickly. How did you learn how to do things in Tynker? They have these little tutorials that teach you how to do things, like physics or game elements. I got the hang of it and started making my own games using a blank template. What is your favorite thing you’ve made? I don’t think I have one! I think they’re all the same. Do you ever Tynker with your friends? I taught my sister how to use Tynker. She didn’t use any of the tutorials, but she eventually got the hang of it and started making games on her own, after only one game of teaching her. She doesn’t know how to use physics or any complicated things yet, though. What’s your favorite feature in Tynker? Art drawing. I love to draw! How do you think learning coding now will help you in the future? Well coding is like science, and you could code science-y projects. For people that want to be scientists when they grow up, they could code because coding is science-y! Why do you like to code? It’s fun and I get to make games I can play. In Tynker, when you make games, you can make anything! Do you think other kids should try coding? Yeah! If they’re going to be a scientist they should try coding because coding is a science! What advice would you give for kids starting out with Tynker? I would tell them to use the tutorials, or just keep on practicing until they know what every block does! Also in the top right corner there’s a mini-Codey hiding behind the screen. They could drag blocks to him and he’d tell them what the blocks do. So true – not only do kids like Tyrus deserve to be recognized, but the recognition they receive can also help them be an example to other kids! Thank you so much for chatting with us, Trisha and Tyrus! We’re excited that you’ve enjoyed Tynker, and are looking forward to seeing your “uppy world” project – it sounds great. Keep coding!